Mom’s bread making took place on Wednesday mornings. She made 8 loaves that were meant to feed a family of 7 through a week. The yeasty scent coming from our kitchen on Wednesdays always brightened everyone’s mood. 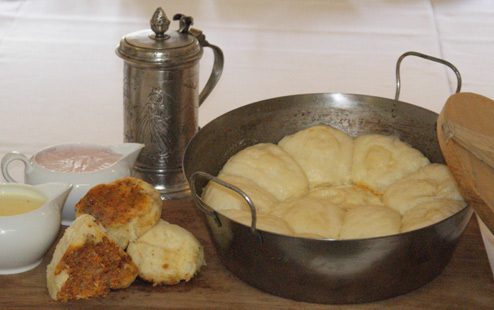 On some Wednesdays, Mom would make Dampfnudelen for supper from the bread dough. She used a knife to cut pieces from the dough and roll them into dumplings. The balls were then put into her cast iron frying pan to which she added some water. She put a lid on so they would steam, and when they were done they were the size of tennis balls. I particularly loved the crusty bottoms when she scraped them from the pan. My brother and I added mayonnaise to the Dumpfnudlen. Mmmmm, my mouth waters just thinking about it now. Mom’s Bread Ritual– Bread is never simple. You think it is. You look at it and it is just there, waiting to be eaten. Best when warm with butter running off its edges having come out of a hot oven on a cold gray Montana day; the kind of day when the kitchen light had to be on all day. When Mom opened the oven door to take the bread out the windows steamed up and you couldn’t see outside, unless you rubbed a spot with your elbow to check and see if the world was still out there. It was a cozy nest of warmth and light in that little room dominated by the stove, the linoleum practically jumping out at you in its own brightness. Bread days. My favorite day of the week. Wednesdays. (Mondays were washdays, Tuesdays, ironing.) Her big, bony hands working the dough down in a large plastic beige square tub, the same tub she used to haul potatoes and carrots in from the garden, covered with the stickiest earth that never seemed to scrub clean. Six loaves, maybe? There were so many of us, she had to make enough to last until the next Wednesday, and we all wanted the fresh end of the bread, the crust, that you could hear crunching as she ran her knife through the loaf, slicing it off for you, still hot almost, and then the butter you had to lick off your fingers because it couldn’t stay on the bread. It became liquid, running from all that heat. She loved it. It was her weekly art form. She was painter, watercolorist, sketcher, the landscape artist of bread. Remember the bread I baked? Mom wouldn’t teach me how to do it when I was a girl. “You’re too impatient to learn,” she said, although I think she didn’t want to be bothered, taking time away from her art. Years later, when you were a girl, I stood next to her in her kitchen, having come home for a visit and determined to learn the art, a measuring cup in hand. Every addition to the dough she made, I counted. “That’s how many cups, now?” and she became irritated because I kept asking. I learned to make it, though, remember? I was so proud of myself. I fixed your lunches for school. You and Joel complained that the sandwiches always fell apart. They sure did, didn’t they? I think the secret to not having bread fall apart is to use either less yeast (you see, I used the quick-rising and I think maybe you should use less if you use that kind), or to do what I have just learned: You can still use three envelopes if you use the regular yeast. It seems to work lately! Good luck. Oh, and the secret Lydia taught me is, that most people when they are making bread the old-fashioned way, will put the oil in with the yeast and water. In this recipe, wait until you have added all the flour and are ready to let it rise. Then, work the oil in from the top down. Bread Recipe – 8 c. water, 5 ¼ t. honey, 3 t. salt, 3 envelopes yeast. Work with hands coming up from sides and pushing down in center. Don’t add too much flour or it will be too stiff. It should still stick to your fingers. When you have all the flour worked in, add: ½ c. oil about half at one time, work in from the top. Cover with a towel and let the dough rise until double. When it’s ready to work down, pour a little oil over the top. Make into loaves. (This recipe makes about 6 loaves.) Let it rise again. Heat the oven to 350 and bake until golden brown. This should be between 45 and 60 minutes. *To make whole wheat bread, I use a combination of white and whole-wheat flour. The first number is for the white flour, the second for the whole wheat.